Although she has been working alongside us since late summer, I’m only now introducing Janelle Beasley to our blog audience. Janelle is the Works on Paper Preparator at the Eskenazi Museum of Art here at Indiana University. The art museum is currently undergoing renovations and will reopen in the fall of 2019. Employees were relocated to offices across campus and as the construction began, Janelle was welcomed with a cozy corner in our lab here in IU Libraries Preservation where she will reside for the near future. 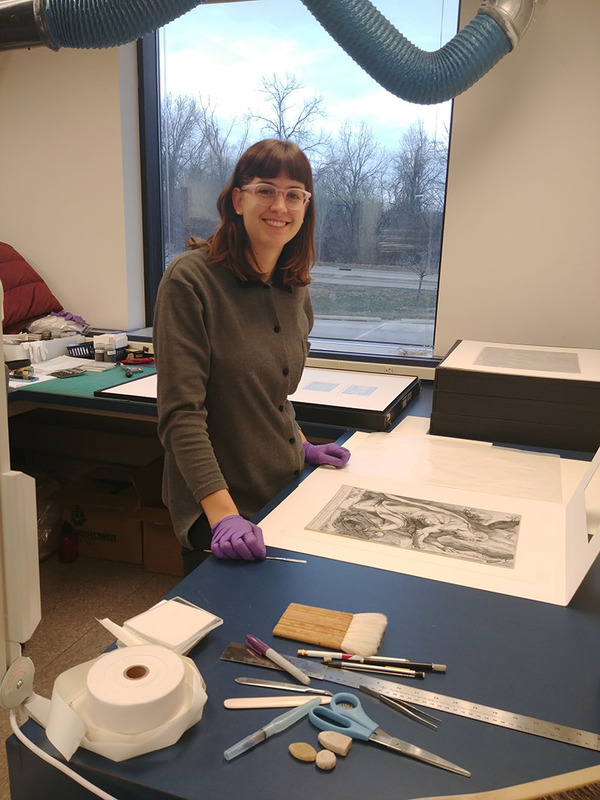 The lack of public exhibition demands is allowing her to perform some comprehensive rehinging and matting work on aspects of the Old Master print collections as well as modern and contemporary photographic works. Improved conservation facilities are on the list of changes at the museum- giving Janelle first-hand experience with lab space development too. Janelle has been with the campus museum for several years now and brings to her position a wealth of experience from the commercial framing world. She’s adding to this by acquiring some new skills in paper conservation and preservation through workshop attendance and mini-lessons from us. It’s a win-win situation for us here in the lab too! We get extra company, and we can share some of our tips and techniques while looking over Janelle’s shoulder at the beautiful wood engravings and etchings she busies herself with.